The Shivanga sadhana is a powerful 42-day vrata (period of sadhana) for men. Shivanga initiations are now available at many cities around the world. Find the schedule for Mahashivarathri 2019. Shivanga is a journey from being a part of creation, to being a part of the source of creation or the Creator. Every life around us has the same source but the biggest advantage, challenge or possibility that human beings have in their lives is that we are capable of realizing it. We are capable of making it into a conscious process. None of the other creatures can realize that they are made of this stuff. If you light the fire of devotion in your heart, you will not live here as a piece of earth, but as a limb or a part of Shiva. Shivanga literally means, “limb of Shiva.” Offered by Sadhguru, this sadhana enhances receptivity to the energies of Dhyanalinga, and allows one to explore deeper levels of experience in body, mind, and energy. The Shivanga sadhana is a powerful 42-day vrata (period of sadhana) for men. Shivanga literally means, “limb of Shiva.” Offered by Sadhguru, this sadhana enhances receptivity to the energies of Dhyanalinga, and allows one to explore deeper levels of experience in body, mind, and energy. The sadhana is also an opportunity to make a pilgrimage to the sacred Velliangiri Mountain, and be initiated into Shiva Namaskar, a powerful practice. Initiation into the Shivanga sadhana for Mahashivratri will be offered on January 20, which is the first full moon day of Uttarayana. The initiation is available in many cities around the world. 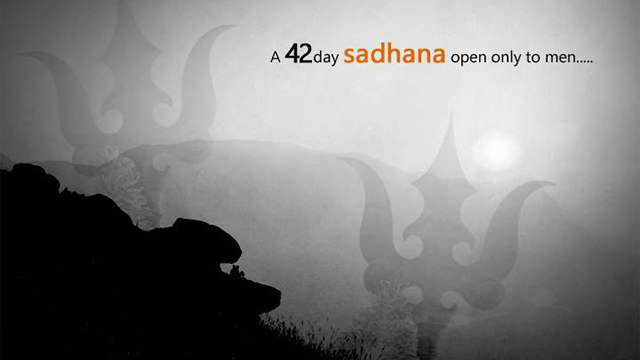 The sadhana culminates on Mahashivratri on March 4 at the Isha Yoga Center. Editor's Note: For further details, please contact +91 8300015111 or email shivanga@southkailash.org or visit www.shivanga.org. Namaskaram - I want to be initiated into Shivanga on Jan 23rd. I will be in Bhopal (MP), India on the day. Cna I take the initiation in the city? or Online? I am also planning to attend Isha MSR package, can I do that along with Shivanga? Thanks a lot Sadhguru for this wonderful opportunity. I can't thank you enough. I am eagerly looking forward to get initiated. Pranam Gurudev. In all the 42 days do we need to dedicate all the 24hrs to it? because i'm an IT employee in Bangalore is it possible for me to participate in this ? I am wondering, is it must to visit Velliangiri Mountain at the end of Sadana? u need not dedicate 24hrs.. Even if u spend 1 min per day towards shivanga, u need to do it whole heartedly with 100% awarness and consciousness . U have to forget ur identity &amp; ego in that 1 min . Thats shivanga sadhana. Can anyone share the experience? I know this would be beyond words, but someone please try, so many would take this up! just to know clearly what are all the restrictions to be followed during the sadana and is it all complulsory. தற்போது சிவாங்கா விரதம் மேற்கொண்டு உள்ளேன். வயது 47. இது வரை எந்த விரதமோ யாத்திரையோ சென்றதில்லை. இந்த விரதம் பற்றி வார்த்தைகளால் விவரிக்க இயலாது . உணர்ந்து அனுபவிக்க வேண்டிய உயர்ந்த ஒரு சாதனா . சத்குருவிற்கு வணக்கம் . நன்றி . Damaru, Sounds of Isha’s newest album, features a collection of your favorite chants and songs on Adiyogi.